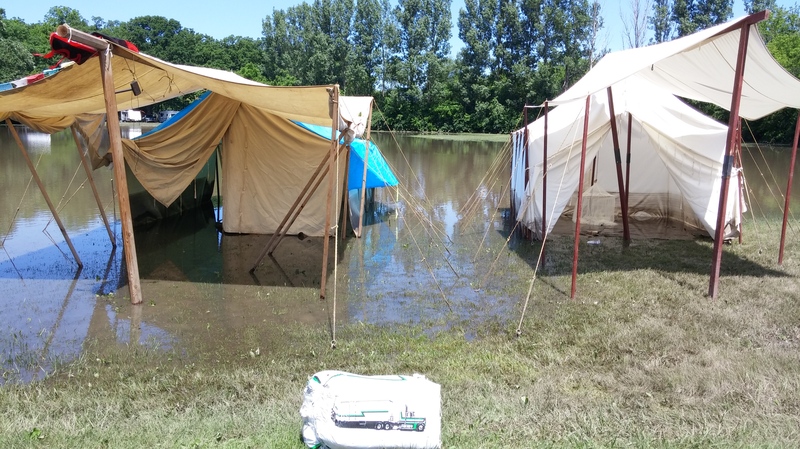 On June 30th Circle Sanctuary issued a statement in response to the early closure of their largest event, the Pagan Spirit Gathering (PSG) due to flash flooding. Besides other measures “Circle Sanctuary is offering a gift to all 2015 PSG paid registrants who request it — a $100 certificate ($50 for minors aged 12-17) that can be used toward any Circle Sanctuary event, including future PSGs, through June 21, 2020. This is a gesture of commitment to our community, to do what we can to promote healing. Please understand that this is a gift, not a refund or compensation for any loss.” The early closure was the first in 35 years of PSG, and the Circle community has rallied in support of the organization, and for the healing of those most effected by the waters and trauma of the flooding. I spoke with Bob Paxton, Circle web and email administrator, an ordained Circle Sanctuary minister for seven years, current PSG assistant manager, and a Circle Sanctuary land maintenance volunteer each week. N: What went into the decision to offer this gift? Bob: After we unloaded the truck and started to think about things going forward we as an executive committee met, and had a long in person conference and tried to figure out what the best way forward would be, not just for Circle Sanctuary but for the PSG community as a whole. There were things that we knew we would do as church relative to the community, such as mobilizing our ministers to provide spiritual counseling. When people come to PSG they bring a years worth of spiritual work they intend to get done. To a substantial degree that work was short circuited by events. There was a need for energy work and spiritual healing, and so we put out a call to the community to send in requests that they had We held full moon, our regular circle, and had it focused on healing and recovery from the events at PSG. There was a healing altar and about three dozen people in attendance, and we did an energy working to bring peace and solace to those effected. Thirdly we decide because so many had lost so much during PSG, not just physical loss but the opportunity to do the work that happens there, to give a gift to the community for those who felt they needed it, a certificate toward admission to future Circle Sanctuary events. Good for not only for PSG but for future events on Circle Sanctuary land. Why is a gift appropriate? Bob: There are two sides of that. A refund is an actual return of money. You gave us X number of dollars, we are giving you X number of dollars back. The reality is that PSG is Circle Sanctuary’s single largest fund-raiser, but Circle is pretty well diversified in activity to bring in funds year around. As we looked at the numbers we saw that we could not give a refund of any sort without severely impacting the work that Circle Sanctuary does for the community year around. There are people who approach the entry fee to PSG as a simple purchase. Most events have a calamity befall it do not provide refunds because of an act of nature. An act of nature occurred that rendered the PSG site as unsafe for occupancy so we elected to close the gathering early. The gift certificate is a gesture to help people severely effected by the flooding to come to future events. Last Sunday, March fifteenth, during the afternoon tea at the conclusion of Paganicon, seven veterans who served in various branches of the armed forces were honored. In a community ceremony of recognition and appreciation, Selena Fox presented the Pagan Military Service Ribbon to Pagans who have served or are serving in the US Armed Forces. Pictured from top, clockwise are Wayne Sears, John Farrow, Herbert Cook Roy, Celeste Proe, Shawn Burns, Debbie Olson, and Tamia Finnegan. They received their pin to the applause of appreciation and support from the over hundred community members present. The Ribbon pin, created by Circle Sanctuary in 2011, is being presented to Pagan veterans and troops around the country who request it. If you are a veteran please visit the ribbon website to participate in the honoring recognition. Please congratulate these service members! I received word at Pantheacon Sunday morning of a friend’s passing. He was not a famous author, or leader of a tradition, or a major contributor to the intellectual development of Pagan philosophy. For many in the Madison, WI area and the Midwest, Circle Sanctuary, Pagan Spirit Gathering ( PSG ), and hand drumming community, he was their rock. 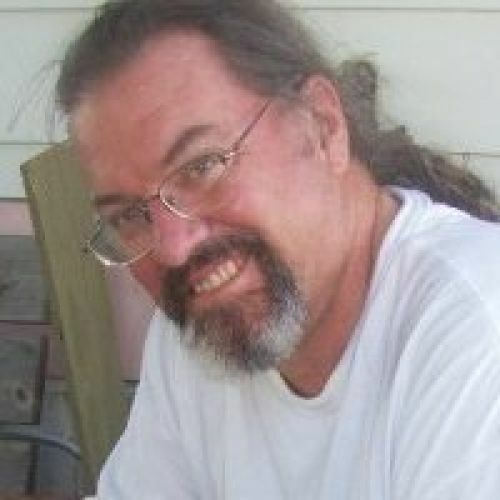 Dennis Presser passed peacefully and unexpectedly of natural causes Saturday, Feb 16th at the age of fifty-four. He is survived by his loving wife of 25 years, Laurie Blue Heron, and his two children; Hunter and Allegra all of Madison, WI. The details of his long history of service, as a veteran and through his dedication to environmental organizations are elaborated on his official obituary. As an activist conservationist he worked, often in leadership positions, to preserve and improve the outdoors he loved so much as a Pagan, hunter, and trout fisherman. The loss of Dennis is felt across the breadth of his influence as a force of dedicated service to others. In the Pagan community, he was known as a man of great personal strength, generosity, commitment, and ethical responsibility. He was willing to speak out and act in support of the people, community, and the natural environment he so loved.